It's been beautiful here for the last few days but another cold snap is on its way. Not complaining though after I look at the weather up north. But anyway, for those who hate the winter and love the beach, here's some live streams of the ocean. Love the one where you can hear the birds. Building a bit on yesterday's post, talking about Casey got me thinking about the Newmans. For many years I was virtually a member of that family. I loved their kids like they were my own. I watched them grow up. One summer I spent a couple of weeks "babysitting" Jo while the rest of them were out of town. Seems like only yesterday I was driving her somewhere and telling her not to tell me what she was doing behind her parent's back because I would be duty bound to squeal. I remember once when she was about 13 or so, she told me she was the perfect child. She was right of course. She excelled at everything and never got in trouble. So anyway, I googled her to see what she's up to these days. Good Lord, she's all grown up. She's modeling for one thing. 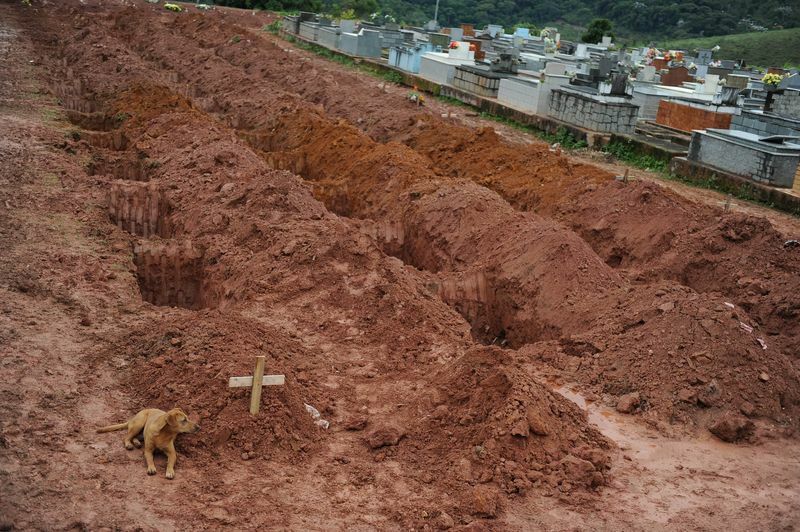 A dog, ‘Leao’, sits for a second consecutive day, next to the grave of her owner, Cristina Maria Cesario Santana, who died in the week’s catastrophic landslides in Brazil, at the cemetery in Teresopolis, near Rio de Janiero, on January 15, 2011. Much more about loyal pets where I got this photo. There is no love more unconditional than a loyal dog. I had a dog love me like that once. The second time she wasn't even "my" dog. Casey was a Golden Retriever that belonged to my employer. The pup and I bonded over long years of my housesitting for the boss. No other living being on this earth will ever love me as much as she did. I was heartbroken when she died of old age. Still miss her. Didn't get around to storing up posts yesterday because they called me into work. Had to work a scheduled shift today. And I picked up another shift for Saturday. So yeah. Really needed the extra hours. Astounding that my life has come to the point where I'm happy to go the big box store. Not really what I expected to happen when I moved down here six years ago. Not sure why I haven't been posting here. I certainly have had plenty of time. The big box store cut my hours to the bone right after Christmas. Only scheduled for 12 hours total this week and they haven't been calling me to cover other shifts when people don't show up. Not much has been happening anyway though. It's been unusally cold and I've been sleeping like it's November. If I stay under the covers I can avoid turning the heat up to just really cold instead of almost freezing. I did have a birthday a couple of weeks ago. I don't usually get presents anymore but I do treat myself to something in celebration. This year I bought myself a bathroom plunger. I'll spare you the gory details but having a working toilet was the best gift ever. Meanwhile, don't want to jinx it but I'm planning to start posting here regularly again. As always, thanks for sticking with me through the dry spells. Jack LaLanne is gone at the age of 96 and I'm sure you've all seen his infomercials for the juicer that he was doing right up until the end. But I'm so old, I remember doing the exercises along with him when he had his original show. Loved that guy. As far as I'm concerned he was the best exercise guru ever. Only one that ever came close since was Denise Austin. Funny I don't see her on teevee anymore. Then again I haven't had cable for a long time. The power of the viral video on the internets can be a beautiful thing. Love the happy ending to this story. It starts with this youtube interview done by a local reporter with a panhandler. The video goes viral and just now, fresh off the internets, we get the happy ending. The guy gets a dream job with the Cleveland Cavaliers and a house. How heart warming is that? I can't seem to stop watching this video. The song Barnicle Bill the Sailor came up in a conversation last night and someone linked me to this old Popeye cartoon. I had forgotten how violent and politically incorrect they were. Funny, I watched them regularly and didn't grow up to be an axe murderer or a bully. Animation was sure a lot different in those days when they did it with artists drawing them cel by cel instead of using computers. Found on Facebook through a mutual friend. That's me at the far left in the black suit, before I colored my hair and lost more weight. 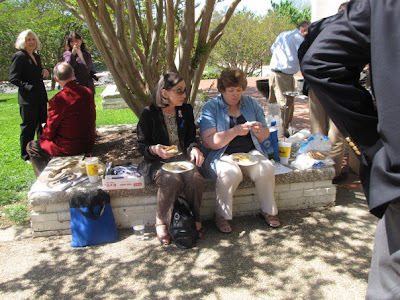 Taken at the County Democratic Convention last spring.